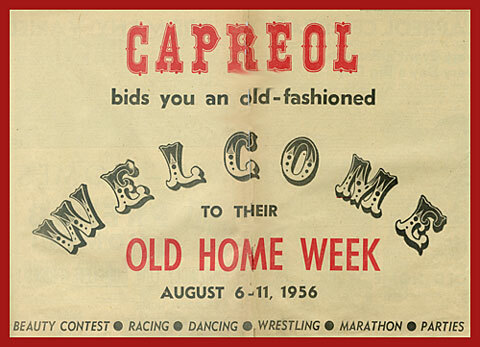 1956 Old Home Week. It is an amazing tribute to the citizens of Capreol of that time; taking into account that the population of the town was half of its present size. It was six days of events, led off by a parade on Monday at 11 am, ending on Saturday with Giant Fireworks at River front. But then Capreol was a bouyant town with dedicated citizens, and not a backyard to the city. I am told that in those days if you wanted to do something for the town you went ahead and did it. The Parade - Old Timers Welcome - Chamber of Commerce - Whiskerinos etc.